E: These are one of my favorite recipes from my mother. 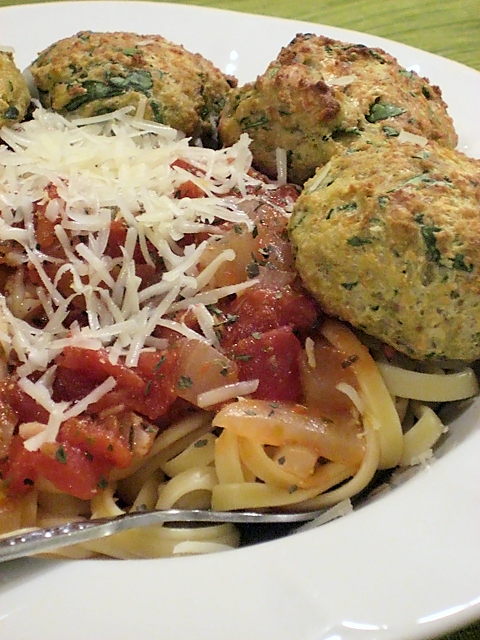 When posting them to the blog I decided we should do a twist on them, so we used them as a sort of meatball with pasta. I’ll include the recipe for the sauce (which, if you’ve read our coq au vin post, should seem eerily familiar—we made some slight cooking-order changes here, largely because we didn’t want to be bothered with removing things from the pan to cook other things separately) but the main star here really is these tuna balls. At home I don’t think we ever had them with pasta. They are definitely delicious on their own as the main part of a meal, but I figured they look like meatballs so why not try it. I encourage you to use them alone or in pasta. They would be a great appetizer or side dish, too—I can just see bite-sized tuna balls on a tray at a party, with little toothpicks in them! You may have to change the amounts of things to your tastes, but the combination of lemon, tuna, and mustard seeds is really a winning one. Try them both with chives (subtler and prettier) and with onions (more flavorful, but also more boring looking), or be really daring and use both at the same time. Whatever you do, enjoy another recipe coming straight from my past to (hopefully) your future! J: We here at Nombudsman have a thing for meatballs. They are self-contained spheres of deliciousness, and homemade ones (is there any other way to go?) can have so much awesome flavor packed into them that you could almost eat them as a stand-alone meal. … but, when you have an excuse to make pasta, you may as well, right? I mean, boiling water isn’t that hard, I’m sure you can spare a pot to set on a back burner and let the pasta take care of itself. It provides a nice little bedding for the meatballs to nestle into, and mellows out the sauce just enough that it’s still awesomely distinctive but not punch-in-the-face strong. 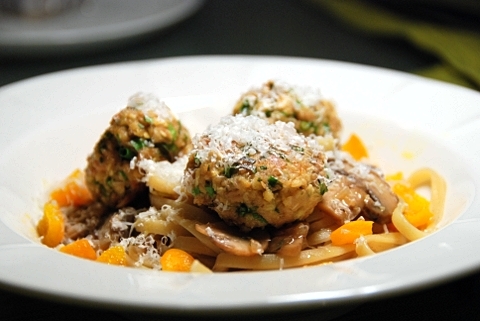 These meatballs were pretty great, in the context of the pasta and sauce. And they have no meat in them! They are entirely vegetarian (though I’m going to refer to them as meatballs for the purposes of simplicity here). If/when we make these again, though, we decided we’d probably do a couple things differently, because on their own we thought that they could have been a little more flavorful. So, I’ve noted our suggestions and modifications in the ingredients list, and if you decide to try them, let us know how you thought the meatballs came out with the changes! Okay, we’ll get started with the meatballs and then move on to the pasta sauce. You are currently browsing entries tagged with meatballs at Nombudsman.